It’s not at all new news that I’m pretty epically terrible at technical crits. On a good day, I can usually find my way to the front of the race a handful of times and maybe throw down one or two good attacks. maybe next year. I’m totally going to petition USAC. After Nationals (where by the way I somehow managed to get a fire ant infestation in my rental car … how the heck does that even happen?!) I had nearly a month off before my next team race. In the interim, my amazing teammate Nicky headed up to BC for a bunch of big-money (txs weak American dollar & favorable exchange rate!) races that are part of the BC Superweek. I went up for a couple of them to try and help her win some cash. The first race had a freaking U-turn in it which of course terrified me. What terrified me even more was the roughly 7’8″ (oh excuse me, 2.24 m) German girl who liked to ride real close to me and take the U-turn like she was the only one on course. On the last lap I got right behind Nicky before I remembered that you’re supposed to lead out your sprinter from in front of her, not behind. Lesson learned. 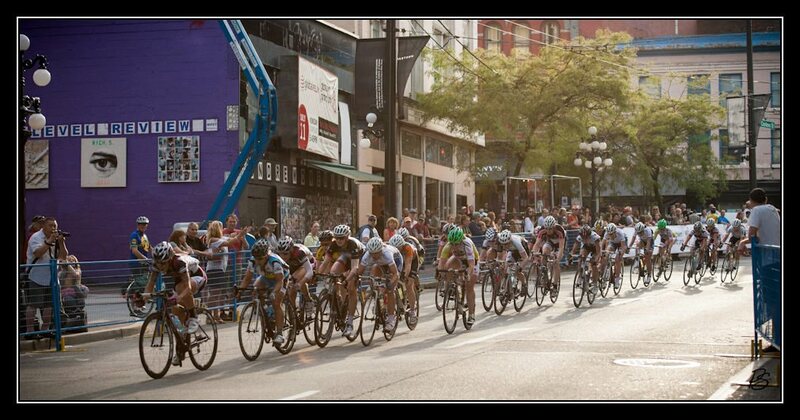 Gastown Grand Prix was the next day. The prize purse boasted a $8,000 CAD (oh excuse me, $7,828.55 USD) payout to the winner. Nicky, in her kind fashion, let me know that she wouldn’t rely on me for a leadout and she just wanted me to attack attack attack and see if I could get away since we all know that’s the only way I can win a crit. So I did it, I attacked, and I bridged, and I attacked some more, and I chased and I tried to move the giant German off of Nicky’s wheel. Going into the last lap I had tried everything short of crashing out the whole field to get away and none of it had worked. I resigned myself to not winning until I realized “oh duh! my teammate is one of the best sprinters in the U.S.!” Coming across the start finish on the last lap I realized that Nicky was only two wheels in front of me. I also realized that there was no use sitting in for the sprint where I probably couldn’t do much better than 7th or 8th. Going into the hairpin corner I came around Nicky on the outside determined to move her up. On the straight away I just heard her telling me to go! I sprinted the straightaway like corner 2 was my finish line. When Nicky did come around I had nothing left and sat up, effectively sweeping off her wheel and gapping off some other sprinters. There’s even a picture of it so you know I’m not lying! At the end of the day Nicky finished up 3rd which was awesome exposure for the team. Even though we didn’t win the $8k it was so great to finally make a step towards figuring out a skill that has eluded me for years. I got back from Gastown late Wednesday night flying high from having such a fun race with such a great teammate. Unfortunately Thursday morning I was flying pretty low when I got doored by a cab driver on my way into my office and had to spend the whole day in the emergency room not being allowed to eat the delicious pastries that were in my backpack and then promptly throwing up all of my pastries after whatever evil painkiller I was given made me real sick. 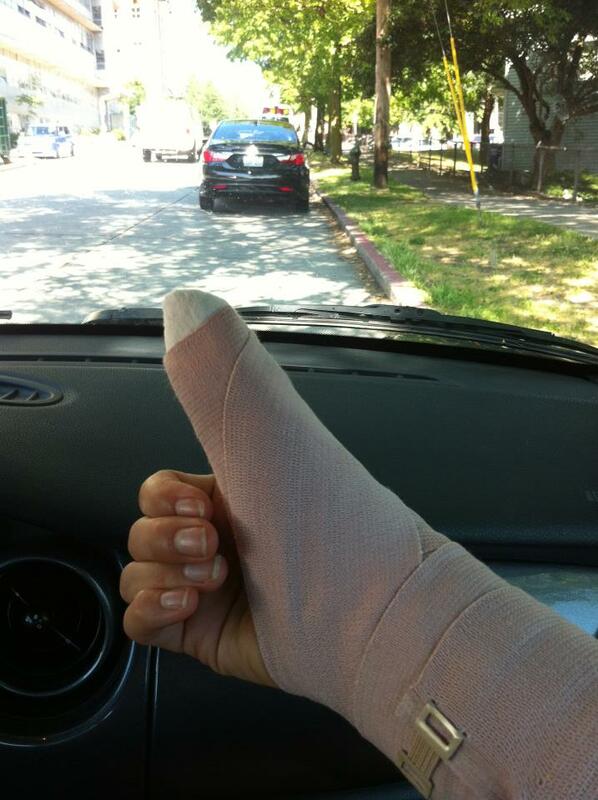 Even so, I’m a fighter and I’ll give the treatment I received a big fat thumbs up! Onward to Elk Grove where I hear there are lots of U-turns and very few German giants! I’m totally ready. This entry was posted in Racing and tagged crash, Criterium. Bookmark the permalink.